Confused by the TV impression of watching climbers put in the strain and power output? You are wrong. With just the right mix of stamina and strength, you are on the summit and the exhilaration is all yours! If you have tried climbing indoors then take the sport back to its roots of climbing outdoors. Kill your fear for heights with our adrenaline event of climbing across Scotland. The key to the right grip: relax. So if, you are bitten by the climbing bug, try this adventure activity on your hen, stag or corporate day. Show your Stag the ropes when you take on wall climbing session. 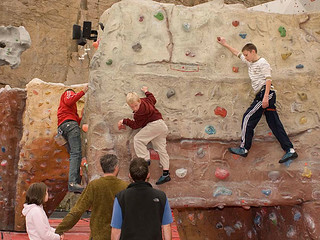 The climbing centre is fairly close to Edinburgh so really easy to get to.